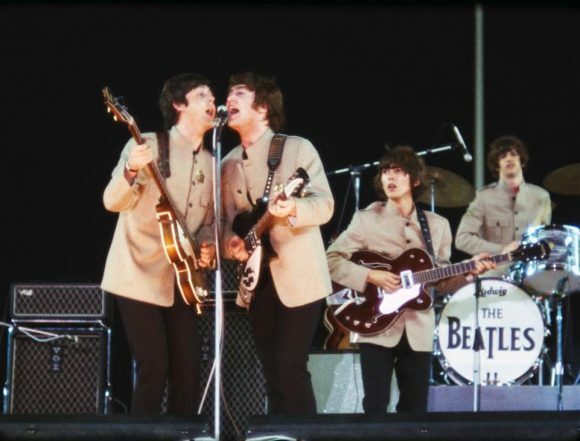 The Beatles' record-breaking first performance at New York's Shea Stadium was watched by 55,600 fans, and marked the beginning of the group's second full US concert tour. The William A Shea Municipal Stadium, to give it its full name, was the home of the New York Mets baseball team. The stage was located on second base, far from the audience, which was confined to the stadium's spectator areas. Now we were playing stadiums! There were all those people and just a tiny PA system – they couldn't get a bigger one. We always used to use the house PA. That was good enough for us, even at Shea Stadium. I never felt people came to hear our show – I felt they came to see us. From the count-in on the first number, the volume of screams drowned everything else out. The Beatles had hoped to land on the field by helicopter, but the idea was blocked by the New York City authorities. They travelled by limousine from the Warwick Hotel to a heliport, from where they were flown in a New York Airways Boeing Vertol 107-II helicopter, over New York City, to the roof of the World's Fair building in Queens. From there they boarded a Wells Fargo armoured van, where they were each given a Wells Fargo agent badge, and were driven to the stadium. The journey, which involved a sightseeing opportunity over the skyscrapers of Manhattan, was filmed by Ed Sullivan's company Sullivan Productions, in association with NEMS Enterprises and Subafilms – owned by Brian Epstein and The Beatles. The concert was also filmed by 12 camera operators. Other acts on the bill were, in order of appearance, Brenda Holloway and the King Curtis Band, Cannibal & The Headhunters, Sounds Incorporated, and the Young Rascals. The Beatles were introduced by Ed Sullivan. Now, ladies and gentlemen, honoured by their country, decorated by their Queen, loved here in America, here are The Beatles! The existence of a ticket stub is less certain for this one, but it’s probably the most famous concert my mum ever attended. She dragged her best friend (my godmother) from Philadelphia to New York City to see the concert with her – unwillingly by all accounts, as she was herself more of an Elvis fan and complained of being very bored at Shea. Interestingly, it wasn’t until reminded recently about the amplification issue that my mum remembered not being able to hear very well. She confirmed that it was indeed extremely hard to hear the lads. Not to be a nit, but we shouldn’t be calling a baseball field a “pitch”. I sure heard it when I visited England and referred to the “soccer field”! OK, thanks for that. I’m English, and baseball’s not so popular over here in the UK! Forgive me for not knowing such basic terminology (and sport’s not really my area of expertise anyway). I was there with my girlfriends I think o the 2nd level. I had the sign JO LOVES JOHN the other sign was a british Flag with a sign for John. I have seen my sign on copies of the shea stadium concert. I still have it. My friends crack up when they see it. I also have my ticket stubbs. Just imagine how many more thousands would have attended if they’d allowed fans onto the field like they do nowadays for gigs at baseball stadiums? Have my ticket stub – Sec 31 / Row A / Seat 16 – Gate D – Sun Aug 15, 1965 – $5.65. I was very upset because I really wanted to hear them sing but due to the loud screams could not. I recall Paul trying to quiet the crowd but it was a losing battle. Even so, I’m glad I was there to be part of the experience. Re: the setlist – I think this was the only time they did Act naturally on the US tour. On other shows that are recorded it’s I wanna be your man as Ringo’s song. John played his Gibson electric/acoustic on the song I feel fine on the NME gig in April, as well as the shows in Europe 1965, but did not use it for the Blackpool & Ed Sullivan TV shows or the US tour. Still, it was kept on stage, I suppose just in case he wanted to use it. And next time you watch the footage from Shea, don´t miss when John is backing to take a bow after Ticket to ride and George just manages to jump to the side to avoid collision! Shea was also one of the 1965 US tour shows that had a vast distance between the performers and the audience. The others being Atlanta, Chicago, Minneapolis and San Diego. More reflections about this show. They didn´t sing or play very well here so it´s understandable they wanted to fix it for the TV show. The vocals are not very good, they obviously didn´t prepare their voices before the show, and Paul´s microphone didn´t work at all during Act naturally either. I have fixed up and synced the correct original sound recording (including A hard day´s night without the voice-over) to the film and included the extra film bits I have found of the missing two songs (She´s a woman and Everybody´s trying…), as well as two bits from Eight Days A Week: the complete missing intro to Dizzy Miss Lizzie (Hello Paul -Hello John) and Tony Bennet´s film during that song. End result is a complete show with all available bits included. More music, less screams. And after listening to this show many times, only recently did I hear John bashing the organ after Everybody´s trying to be my baby, for no obvious reason than they were having fun on stage. Oh, and this was the only time Paul introduced Help!, John did it at all the other shows as well as the earlier Blackpool TV show. Strange to think today Help! was only played live twice on TV and at 16 concerts. I was there… I saw them run on the field… My heart stopped, I’m sure of it. I cried throughout their performance. I think it was because I knew that this was a moment in time that was pure and innocent…and never to be again. I was just so happy to be breathing the same air as John, Paul, George and Ringo.